The Biggest Loser in the EU’s Report on the Russia-Georgia War Is … Europe. After the Russo-Georgian War in August 2008, the European Union found itself in a difficult position. Moscow had not only invaded a neighbor for the first time since the Soviet assault on Afghanistan in 1979. In recognizing Abkhazia and South Ossetia as independent states, it had also broken the cardinal rule of post-cold war European security: that borders in Europe would never again be changed by force of arms. Yet Georgia, too, had clearly made mistakes, not the least in embroiling itself in a military conflict with Russia that Georgia's own allies had repeatedly warned against. Passions were high as both sides accused each other of aggression, atrocities, and other violations of international law. What to do? In this bind, the E.U. opted for a classic political answer. It farmed out the task of assessing the war’s origins to an independent commission with an unwieldy name. The Independent International Fact-Finding Mission on the Conflict in Georgia (IIFFMCG)--headed by the soft-spoken but experienced Swiss diplomat Heidi Tagliavini, who has real-world experience running the U.N. mission in Georgia's breakaway province of Abkhazia--was allotted eight months to investigate. Last week, in Brussels, she and the commission issued their much anticipated report. Reading the 43-page summary is a little bit like reading the medical file of someone suffering from a serious illness. The prose is dry, the language at times clinical. It might lull a reader to sleep if the topic itself was not so serious and potentially explosive. The initial media coverage has focused on a single sentence in the report, which says that Georgian President Mikheil Saakashvili essentially started the war by shelling Tskhinvali, the capital of South Ossetia, on the evening of August 7. At the same time, the sentence emphasizes that the incident was the culmination of a chain of events and provocations going back months, if not years. Russia jumped on the first element of that conclusion, claiming proof that it had been right all along. Georgia countered by emphasizing the second part, which it called proof that it had been provoked into war. And, in presenting her findings, Tagliavini went one step further than the report itself by saying that, in her eyes, the explanations provided by the Georgian side did not provide a sufficient legal foundation for Tbilisi’s actions on that fateful day. That certainly gave Georgia a black eye. The Kremlin’s spin machine immediately swung into action to exploit the statement. (Actually, it swung into action even before the report was issued, giving rise to rumors that Moscow had an advance copy.) However, Prime Minister Putin and President Medvedev shouldn't be too eager for people to read the report closely, since the more closely one reads it, the worse it looks for Moscow. That's because, in many ways, the commission’s findings explode Russia’s official narrative of the war as well. The report makes it clear that this was, first and foremost, a war fought between Georgia and Russia, rather than a conflict between Tbilisi and its unruly provinces. Moscow based its official casus belli on three arguments: that Georgian forces had tried to commit “genocide” against South Ossetians; that Georgians had attacked Russian “peacekeepers”; and that Russia had a right and obligation to come to the defense of Russian citizens in these breakaway regions. None of these arguments are confirmed in the report, and all of them are carefully dissected. The report dismisses Russian allegations of genocide as “neither founded in law nor substantiated by factual evidence.” It rejects Moscow’s claim to have undertaken a humanitarian intervention. It concludes that the distribution of passports to Abkhaz and South Ossetians in the years prior to the war--thus creating the Russian citizens that Moscow claimed it was defending--was illegal. 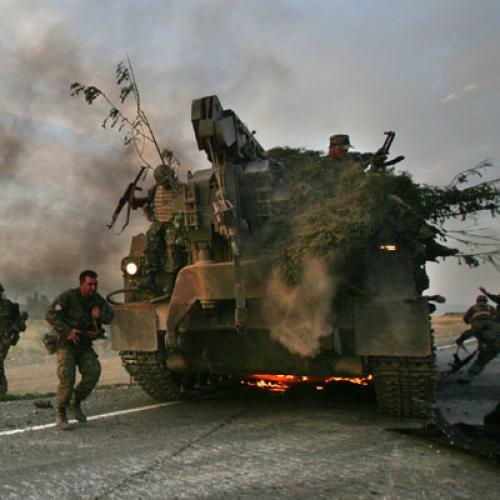 It does acknowledge Russia's right to defend its so-called "peacekeepers" on the ground, but states that Russia’s military response “cannot be regarded as even remotely commensurate with the threat to Russian peacekeepers in South Ossetia.” And, perhaps most devastatingly for Moscow, the report concludes that neither Abkhazia nor South Ossetia had the right to secede from Georgia and that Moscow’s recognition of their independence ran contrary to international law. So much for the idea that it proved Moscow right. Tagliavini's findings arguably do not go far enough in criticizing the West for its own mistakes, which contributed to the slide into war. The report notes that conflict prevention mechanisms on the ground were inadequate, but that is surely an understatement. Tagliavini knows this only too well, having been the U.N. representative in Abkhazia, where, to her credit, she was one of those calling for an expanded international presence to balance Russia’s. Unfortunately, the political will in the West was lacking. Likewise, the report mentions Kosovo's independence and the decisions made at NATO's Bucharest summit, but it does not go into detail about how Western policies actually provided Moscow with a pretext for war. It also skates over the obvious flaws in the peace deal that was eventually negotiated by French President Nicolas Sarkozy. But perhaps that would have been a bit too much for the European Union to swallow. The report leaves unanswered the lingering question, “Why did Georgian President Misha Saakashvili do it?” This is especially relevant, since Tagliavini stated that Tbilisi could not offer a legal justification for its actions. Having researched the issue for my own book and discussed the danger of war with Saakashvili, both before and after August 2008, I believe the answer is straightforward. His actions came after a long series of Russian threats, including those voiced by Putin himself, warning that Georgia would face consequences for proceeding on its pro-Western course. Moscow had rejected secret peace proposals floated by Saakashvili, and Kosovo's independence on top of the NATO decisions at the Bucharest summit had given Moscow a pretext to escalate its pressure on Georgia. Saakashvili then engaged in a desperate response to what he believed was the imminent threat of ethnic cleansing against tens of thousands of Georgian citizens, plus the possible loss of South Ossetia and Abkhazia once and for all, and even a Russian assault on Tbilisi itself. The intelligence picture presented to Saakashvili on that day suggested that Georgia was being invaded in slow motion. Simply doing nothing was, in his eyes, not an option. And he was convinced that he would never survive politically if he just stood by. Of course, one can still conclude that it was the wrong choice. After all, Saakashvili began a war his allies had warned him not to start--a war that they would not support and that he could not win. Georgia’s armed forces were neither trained nor equipped to confront the Russian army. And it is easier to start a war than to successfully end one, as Georgia found out when it was subsequently forced to acquiesce to an unjust peace to survive. But why Saakashvili acted should not be considered a great mystery. The Georgian president was cornered. He believed he faced the choice of going down peacefully or fighting, and he chose to fight. The larger reason the report matters is that the Russo-Georgian War represents a failure of the European security system we have labored to build since the fall of the Iron Curtain. That system was supposed to ban spheres of influence, prevent the predatory behavior of large countries, and guarantee the security of small ones--in addition to providing warning against growing tensions and giving us mechanisms to prevent war. In August 2008, the system faltered. The war represented a clash between the core principle embodied in the Helsinki process, which granted countries the right to choose their own domestic and foreign policy courses--including alliances--and Moscow’s growing determination to create a sphere of privileged interest on its borders. As Foreign Minister Lavrov told Condi Rice at the height of the conflict, Russia’s goal was regime change and the removal of Saakashvili. So we should have no illusions. The underlying conflict between Georgia and Russia has not been resolved. Tbilisi still wants to go West, and Moscow still wants to stop it. Having just returned from Georgia, I suspect some in the Kremlin wish they had finished off Saakashvili when they had the chance a year ago, since he seems as firmly in the sad dle as ever. The conflict is not over; it has only been postponed. And while the "peacekeeping" mechanisms on the ground today may be different--over 200 unarmed E.U. observers--they remain inadequate. Ultimately, the most important questions left unanswered by the E.U. commission are these: Have we drawn the right lessons from the war? Are we any smarter or better positioned today, if we wish to prevent another conflict in Georgia? What about in nearby Ukraine, where trouble also seems to be brewing? These questions are essential, because if we do not learn from our mistakes, we have a recipe for another war--and perhaps another commission to determine why it happened. Ronald D. Asmus is the executive director of the Brussels-based Transatlantic Center of the German Marshall Fund of the United States and the author of A Little War That Shook the World: Georgia, Russia, and the Future of the West, to be published by Palgrave Macmillan.